It was about 4AM when the 405th Squadron’s Operations Officer, Benny Jackson, gave 1/Lt. Garrett Middlebrook and his neighbors a rude wakeup call in the form of a revving jeep backed into the opening of Middlebrook’s tent. First Lieutenant Lawrence F. Tanberg was a little nicer to his crew, but everyone sprang to action, as they would soon take off to bomb a Japanese convoy heading to Lae on January 7, 1943. Major Ralph Cheli would lead the 405th Squadron aircrews on this mission and Tanberg would lead the 71st Squadron. Japanese gunners were ready and waiting for the B-25s, having already filled the sky with more flak than Tanberg had ever encountered. Middlebrook noticed eight Zeros flying toward them and Cheli led the 405th into cloud cover to avoid enemy fire, then they dropped down to begin their bombing runs. Right as Middlebrook went over the target, a flak burst in front of his plane blew out a panel in the nose. His crew, as well as the rest of the 405th crews there, strafed the decks of the Japanese ships below them and dropped their bombs, then made a run for it. Meanwhile, 1/Lt. Tanberg led the 71st Squadron on its bombing run, and the crews unloaded their bombs on the ships at the same time. A split second later, THE EGG CRATE’s right wing absorbed a direct flak burst, sending the plane into an uncontrollable dive towards PACIFIC PROWLER, piloted by Tanberg. THE EGG CRATE’s pilot, 1/Lt. 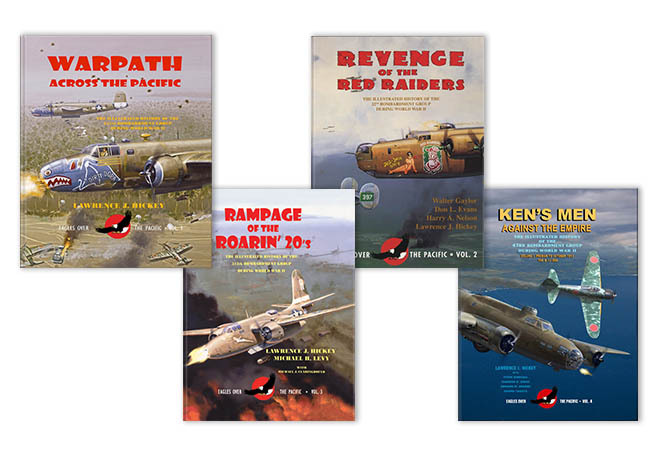 Elmer P. Brinkman managed to turn the B-25 away from PACIFIC PROWLER, missing it by mere feet. 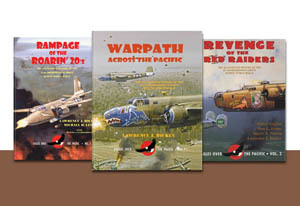 Bombs from Brinkman’s plane that were released on Tanberg’s signal fell just behind PACIFIC PROWLER, a stroke of luck for the entire formation. After THE EGG CRATE dove past the B-25 formation, Brinkman and his co-pilot worked to extinguish the fire that started on board and bring their plane back under control. It was too late: they were forced to make a water landing. This was the end of THE EGG CRATE, which broke in half and sank, with no survivors. Leaving the target area, the 71st Squadron was attacked by several Zeros, two of which broke off their pursuit due to return fire from 71st Squadron gunners. Middlebrook’s aircraft was also pursued by Zeros, but his gunners weren’t shooting back. Word quickly got to the pilot that the turret gunner was badly wounded and bleeding profusely from his elbow, and the bombardier had been cut by glass when the nose panel blew out earlier. 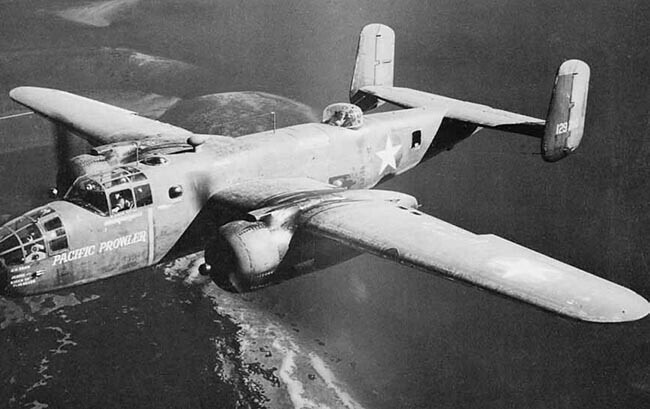 The injured men were tended to by their crewmembers and Middlebrook flew the B-25 back to Port Moresby as fast as he could. For turret gunner S/Sgt. Robert S. Emminger, the crew had to alternate between compressing his wound to slow the blood loss and allowing the blood to flow to his arm to prevent it from dying. Miraculously, his arm did not suffer permanent damage, and both wounded men recovered fully after receiving blood transfusions. It’s amazing what these people did with little or no medical knowledge. Keeping a colleague and friend alive like that was no mean feat! While they were given some basic first aid training before they headed overseas, they probably didn’t imagine treating a crewman in this fashion! S/Sgt. Emminger was in good hands. Wonderful treatment of the injured crewman. He was very lucky to have such intelligent colleagues. He certainly was. They did a great job. The concern for fellow crewmen gives them the strength to do amazing feats. But sad as always to hear of those lost.